My old friend, I so disagree with this. For one thing, there are no fast rules. Much depends on the genre an author writes in. Another depends on the author’s personality. But more than either of those, a complete signature is a courtesy to the person an author is corresponding with. Put that word in caps! COURTESY! There is nothing more annoying than getting an e-mail from someone who doesn't have proper contact information in it. And the trouble is, depending on what the recipient plans to do with the email, it is difficult for the sender to know exactly what will make the life of that contact easier. Will she need your website address? Will including your Twitter moniker help her in some way? Won't the repeated visual of your book cover to your contacts help your branding? And if your contact has seen your cover before, will it hurt her that much to see it again? Especially considering that old marketing advice based on research that people need to see something seven times before they act on it. And don't you––as someone whose business it is to help authors--want your authors to sell as many books as possible and to get as much media attention as possible? In the PR world the winner is the person who makes it easiest on the gatekeeper to do her job. It is a busy world. She doesn't need to be searching for information, especially information that could easily go into a signature. To arbitrarily tell anyone how to sign their emails without any idea of the tone or purpose of the email seems very presumptuous to me. I hope you will give your authors this alternative view. Many authors are already far too reluctant to get the word about their books out there. Telling them to arbitrarily limit information in their signatures may encourage their reluctance to do right by their books—and their own careers. Carolyn Howard-Johnson is a former journalist, retailer, and marketer who started publishing how-to books for writers for the classes she taught for UCLA Extension’s renowned Writers’ Program. Members of the California Legislature named her Woman of the Year in Arts and Entertainment. Learn more about her how-to books and her creative writing at http://howtodoitfrugally.com Learn more about book promotion (and avoiding being the reluctant book promoter!) 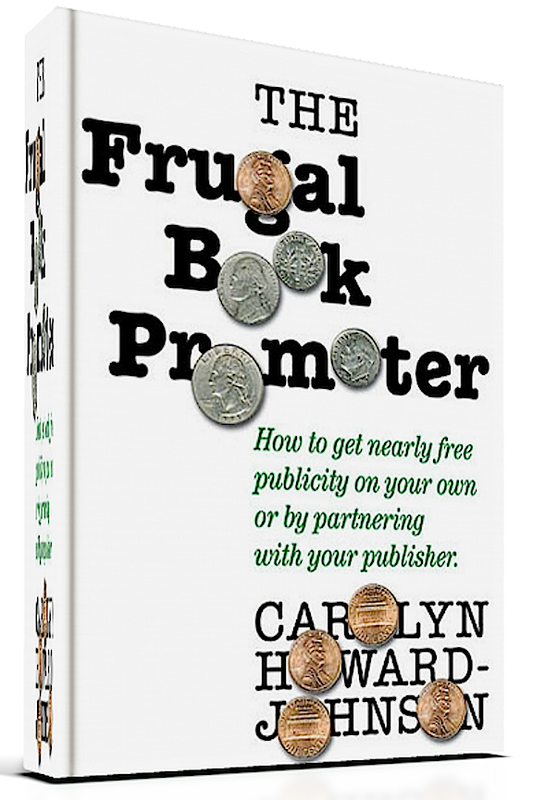 in her The Frugal Book Promoter and the rest of the multi award-winning HowToDoItFrugally Series of books for writers at http://bit.ly/FrugalBookPromo. 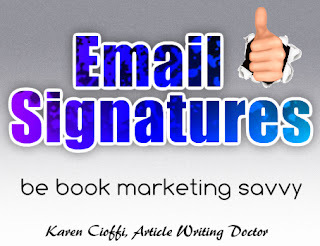 Carolyn, great advice on using email signatures that are book marketing effective. I've clicked on links in signatures - it can make it easier to find out about the author of the email. Great article about Email signatures.Thank you. I correspond with a lot of authors and find it frustrating often when there is no information in their signature on how to reach them or their background or any of a number of things you can include in that signature area. @Terry Whalin, glad you agree. It would be sad to lose a contact like you for lack of information you could use to stay in touch or network that contact!